On February 2, 2014, early in the morning, we departed from Banneux by car, heading for Hilversoom in the Netherlands, where Vassula had been invited to give her testimony. 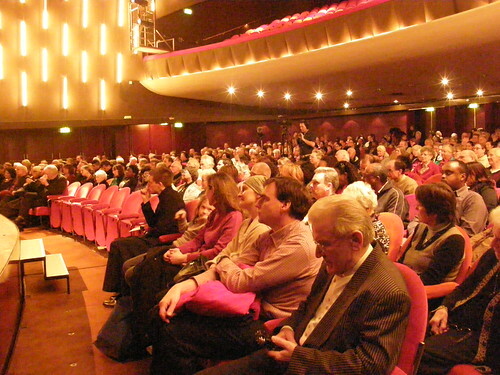 We followed the aligned program’s schedule, as this had been arranged by the Dutch organizers. Upon arriving in Hilversoom, we went to the church of St. Vitus to attend mass. Immediately after the sermon, but also at the end of the mass, the priest announced Vassula’s meeting: the place and time, and urged the congregation to attend it. At the church entrance, Rogelio, one of the Dutch organizers, had been waiting for us, along with a pleasant surprise. . Erwin had come from Cologne to see Vassula in person and to receive spiritual nourishment from her address!!!! As we had very little time, we headed for the hotel to drop-off our luggage and get ready. The Lord’s message saves, so Satan, aware that many souls will escape him, continues his fight through deceived souls, whom he uses to distort Vassula’s work and mission. 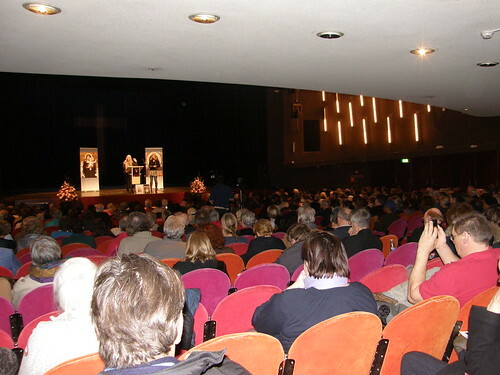 The time available for the organizers to prepare Vassula’s address in the Netherlands was scant and the problems they had to face were many. However, their love for the Lord, a spirit of co-operation, prayer and the love that evangelization for the message gives yielded sweet fruit. Our good Shepherd, in His mercy, multiplies the chosen vines and sends workers, so that each nation may see His glory and listen to His message. The doors opened at 13.30 and as always the admission was free. 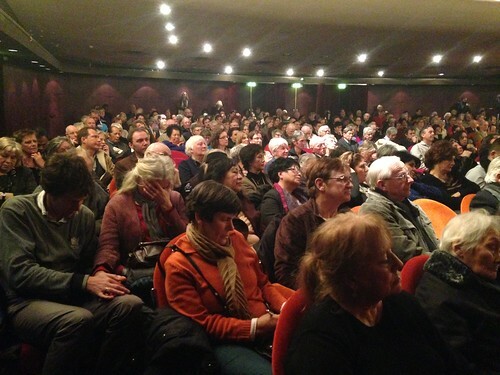 The room, with a seating capacity of 500, was almost full. Among the public were priests from different denominations. 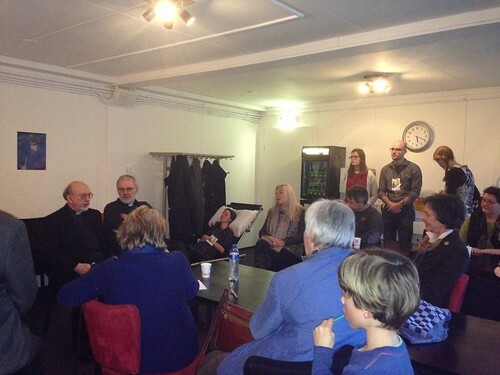 The address was moreover, broadcast live on TLIG radio, and there were 150 listeners. 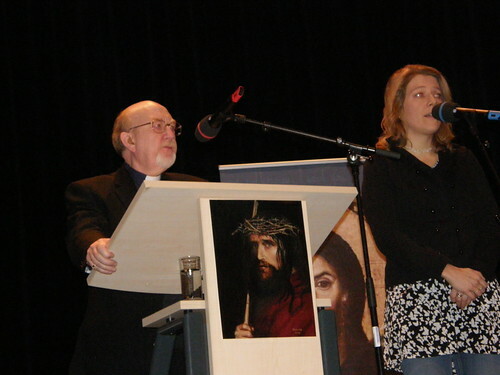 Mariel presented a short introduction to the messages, introduced Father Abberton and invited him onto the stage. Father John Abberton explained the reasons for his attending Vassula’s address. He had come to defend Vassula and True Life in God against the recent calumny they had suffered in the Netherlands. He advised all those who have not read the messages to read them, so that they can develop their own view. He said that the messages are the most important book of our time and stressed that in the history of the Church, God’s messages have never been detached from the person bearing them. “If you accept the messages, you will also have to accept their messenger”, he said. He spoke about Vassula’s mission and invited her onto the stage. 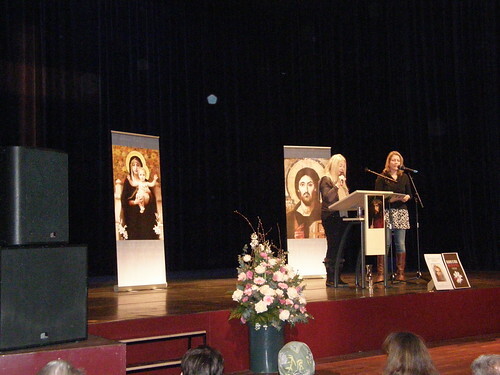 Vassula spoke in English, while her talk was simultaneously translated into Dutch. She greeted the audience, thanked them for attending and for their interest in her address on Jesus and the messages she receives. She asked everyone to rise and pray the Our Father in Aramaic, the language of Jesus. “I am glad to be back in the Netherlands”, she said, and went on to add that the TLIG message is a message of Love, a message of Mercy. Studying the messages helps us to get to know God, to understand Him and approach Him with greater intimacy. Vassula’s address was replete with the Holy Spirit and had a simplicity that touches hearts and brings them closer to God. She spoke about the relationship between the soul and God, the power of prayer, the teachings of the Holy Trinity in the messages of TLIG. 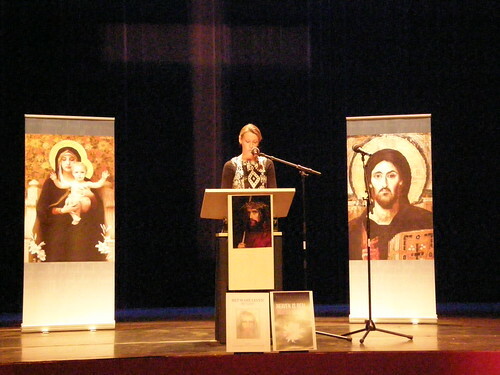 She spoke about the Mercy and the unfathomable love that the Lord has for us, but also about His justice. She added by speaking about the prophecies he gives in order to warn and draw humanity out of its deadly lethargy. 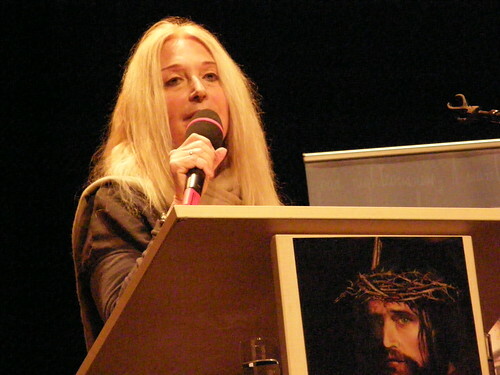 And of course, she spoke about the unity of the Church and the agonized cry of Jesus to unify the dates of Easter. “The time is drawing near… Spread His message… Listen to what Heaven is saying…” Vassula’s address concluded with the prayer of repentance and deliverance given her by Jesus on November 13, 2006. Vassula’s mission which includes the writing and the meetings through which she honours and glorifies the Lord, appeases His anger and helps thousands of souls return to Him! Anxiety about the preparations needed for Vassula’s talk subsided after the address and gave way to a spirit of joy and enthusiasm among organizers. 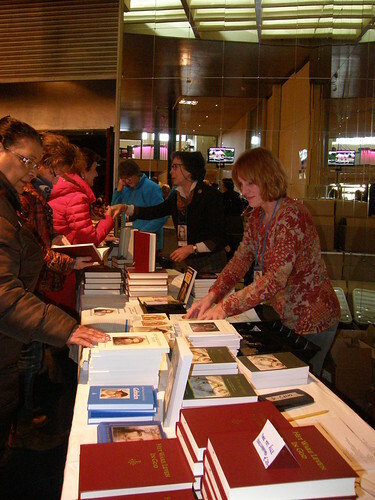 Vassula’s address was powerful and touched the hearts of many people who rushed to get TLIG books. Many left their contact details in order to join prayer groups or to be kept informed about TLIG news and future meetings. Later on that day, there was a meeting between the Dutch TLIG group, Vassula and priests. 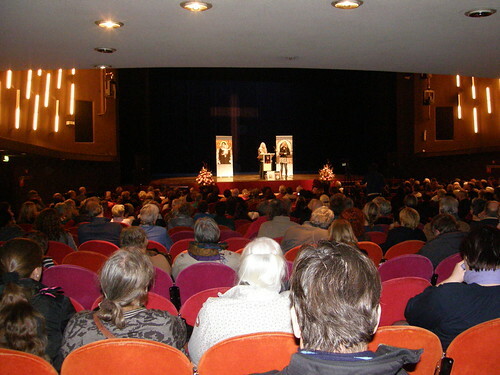 Twenty-five people from different parts of the Netherlands attended, which allowed for the correspondence of the TLIG prayer groups from different cities. Father John spoke about the desire for power, the ego, and the pride that people typically have. He stressed that in TLIG groups everyone is at the same level and no one is anyone’s leader. We are all people serving God, but we have an enemy, the devil, who does a very good job. There are evil spirits working together like a pack of wolves to destroy God’s work. For instance, in every group promoting unity, there may surface the spirit of Jezebel and the spirit of Ahab. They are not demon names, but they describe things that a demon can do. We should beware of these spirits. 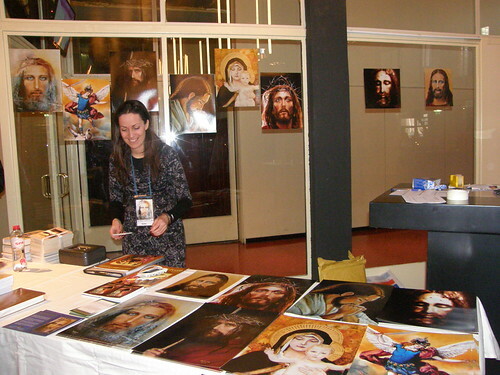 The Holy Spirit, through Vassula’s address, breathed life and spiritual resurrection into TLIG friends and readers, those working for Christ in the Netherlands, so as to evangelize with confidence and love God’s message to their country.